Happy New Year everyone and hope y’all had a great Christmas Season! We have been busy at ProFishNC Charters wrapping up the late fall fishing season, booking charters for spring and prepping for March 2018 Fishing Kickoff. Note: The best bottom fishing for Black Seabass in NC is January through April. We typically find limits within 5 miles of the beach in the winter with a mix of tautog (black fish) and porgies. Once April arrives we have the monster bluefish and Atlantic bonito show up in our local waters. Both Atlantic bonito and bluefish in April are respectable in their fight and is great fun on light tackle (these fish are hungry and actively feeding on the migratory baitfish). 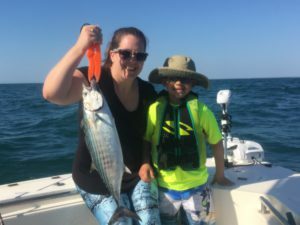 We offer hourly trips for families fishing with small children (typically around 2hrs) that would like to introduce fishing to their family in small doses. This was very successful in 2017 as many families with kids under 5 years old found this charter option the best for their family. This entry was posted in Fishing Reports, Uncategorized and tagged Black Seabass Fishing, Spring Fishing Charters on January 18, 2018 by admin.